[This post was written by Steve Klein. – #1 below – Klein is a former Mayor appointee to the Yelm Library Citizens Advisory Board and subsequently that Board’s chosen Chair. – # 2 below – Klein and his wife Yael are annual donors to the Yelm Community Center holiday food distribution program. – # 3 below – Klein and his wife Yael are property owners in the City of Yelm. – # 7 below – Klein is employed as the Event Services Manager for JZ Knight and Ramthas School of Enlightenment. – # 8 below – Klein and his wife Yael are contributors to the SE Thurston Fire Authority. As discussed here previously, Mayor Harding can tout all of the physical things the city has done to make improvements, like new sidewalks, a partial bypass, Prairie Trail, etc., however one thing sorely missing in this town is the city’s attention to their people’s issues, as shown by the comment above. Additionally, the mayor’s vision for growth continues unabated. Indeed, he said in his State of the City Address that just six weeks into 2012, Yelm already doubled its anticipated building permits for the year. City Council member Mike McGowan crowed last night about the Salmon Run Apts. ground breaking ceremony tomorrow for 40 new apt. units on Vancil Road, bringing more traffic, people and growth directly into Yelm’s urban core, regardless of the fact that they are low-income apts (is this for low incomes? “There are two one-bedroom units that will be priced as low as $479 and a couple four-bedroom units that will cost $751 and $959 per month, respectively.”). 2. The cost of another Community Center structure, when this city already has an outstanding Yelm Community Services facility, suitable for all sorts of public activities. Why doesn’t the city promote it? 3. Utility rate increases for Yelm property owners, again: sewer increase of 5.4%, water rate increase of 8.25%. 4. Continued drop in median home prices. 6. The intense demand on local food banks from our friends and neighbors. 7. The City spent almost $300,000 in taxpayer money and lost a water case in Wa. State Supreme Court last year, brought by JZ Knight. Seven of nine Court Justices sided with the Thurston County Superior Court opinion that the city appealed. This impact will not be addressed. 8. Potential cutbacks at SE Thurston Fire Authority. 9. Burglaries and crime continue unabated. Entries posted here many times over the last 6 years that Yelm Ave. traffic can not be properly handled without its eventual widening. Ask anyone commuting home after 3pm any afternoon through Yelm, especially Thursdays & Fridays. [This post was written by Steve Klein. Klein is a former Mayor appointee to the Yelm Library Citizens Advisory Board and subsequently that Board’s chosen Chair. “The Timberland Regional Library board has put its director on administrative leave. Thurston County representative Emmett OConnell said library director Michael Crose was put on paid administrative leave at the boards Feb. 22 meeting. Crose served as manager of administrative services starting in 2006 before becoming interim executive director. He was hired as director after several efforts to recruit candidates in 2010. Of course, TRL employee, Yelm Library staffer and Yelm City Council member Mike McGowan was giving kudos at last night’s Council session to the over $2 million cost to purchase the 2nd floor condo that will house the Yelm Library, over one million of which is interest expense on low-interest bonds. Isn’t over $2 million dollars for a less-than-desirable second floor facility, and one that is very large and with limited parking too high a price to put on the backs of Yelm citizens? Seems this city spends money like “drunken sailors” during this difficult economy. YELM: CITIZENS BUY A LIBRARY CONDO TONIGHT! The Yelm City Council will authorize spending over one million dollars for the current second floor library plus another million dollars in interest to purchase from Prairie Park the faiclity to be the area’s library. Adopt Ordinance No. 955, authorizing the issuance and sale of Limited Tax General Obligation bonds in the principal amount of $2,050,000, to purchase the Yelm Timberland Library portion of the building located at 210 Prairie Park St. AND to finance other property acquisition and capital improvements. The City and Timberland Regional Library (TRL) entered into an agreement in 2001 whereby the City of Yelm paid a Facility Fee, based on a per capita formula, contributing to TRLs lease with Prairie Park Holdings, for the current library space located at 210 Prairie Park St. This agreement expired December 31, 2011. In 2011, the City Council approved the Citys intent to purchase the current library facility located at 210 Prairie Park St. In February, 2012, the City Council and Timberland Regional Library approved the Intergovernmental Agreement for Building Operations and Maintenance Service whereby TRL would contribute $37,000 per year to provide a level of maintenance for the building. The City has been working with Martin Nelson & Co. to put together the limited tax general obligation bond financing ($2,050,000) for the purchase of the library facility, and other property acquisition and related capital improvements. On February 6th, Standard & Poors issued a rating of A for the upcoming bond issue providing for increased marketability of the bonds. Ordinance No. 955 provides for the issuance and sale of Limited Tax General Obligation Bond in the amount of $2,050,000. This is a 20-year bond issue with annual payments coming from the Citys general fund tax revenues. The final step is to finalize negotiations with Prairie Park. While a storing supporter of a library here, I have always had an issue that PURCHASING this facility is unwise, as the space is too large and the cost too high to be placed on the backs of the citizens of Yelm in such a challenging economic environment. The amount of energy the city put into buying this facility without sharing with the public any other options the city says they viewed, should speak volumes to the public! “The Yelm City Council on Tuesday approved the sale of bonds to purchase the Yelm Timberland Library building. The sale of $2,275,000 in bonds will go to acquire the library portion of the building at 210 Prairie Park Street and to purchase other property and capital improvements. The agreement between the city and the buildings owner still needs to be finalized. Posted by Steve at 6:49 am | Permalink | Comments Off on YELM: CITIZENS BUY A LIBRARY CONDO TONIGHT! 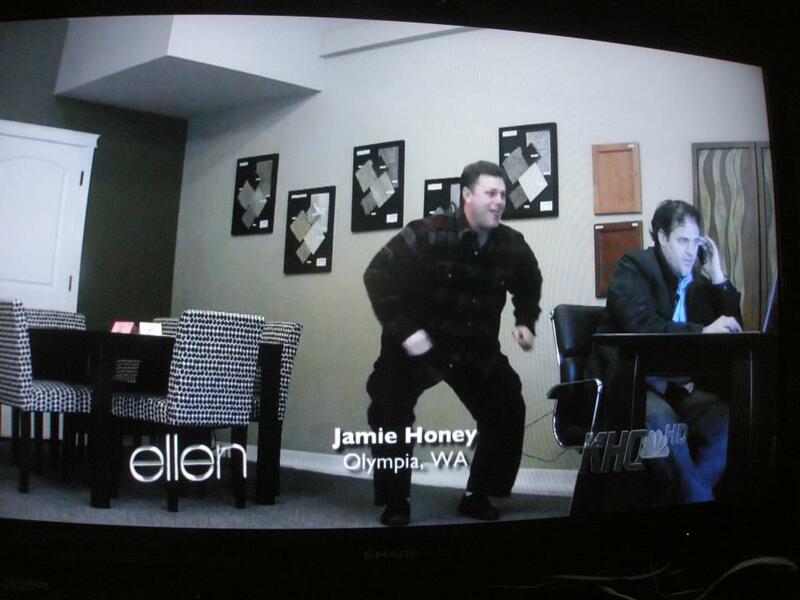 On Thursday, February 2, 2012, Yelm area resident Jaime Honey’s video excerpt was selected and aired nationally on The Ellen DeGeneres Show Dance Dare. [Editors note: This post reprinted from the Ramtha School of Enlightenment Newsletter. Copyright 2012 JZ Knight. Used with permission. Click here to see the video (Honey’s video excerpt begins at 44 seconds). – Mr. Honey is a Guard at RSE. Photo courtesy JZ Knight, copyright 2010-2011. Used with permission. A Press Release issued by Ramtha’s School of Enlightenment (RSE) on February 15, 2012 has been picked-up in nationwide media describing the healing of RSE security guard Anthony Latoski from a damaged heart. Latoski claims he used his mind to employ natural techniques learned at Ramtha’s School of Enlightenment in Yelm. What is amazing in his case is that he has the medical records to document his healing from major damage sustained in a heart attack, with normal blood flow being returned to his heart after the dissolving of a major blood clot. Latoski gave a presentation on his healing Tuesday, February 21st to over 850 students that gathered at RSE’s Yelm campus for their annual Spring Retreat, which was also live-streamed to over 800 students online from over 35 countries worldwide. Read more from My Story, by Anthony Latoski from RSE’s Newsletter., which include his medical records. – Mr. Latoski has been a long-time Guard on the RSE campus. Anthony was interviewed in December 9, 2011 in The Mountain News. Entertainment Explosion presents “A Really Big Shoe Six” – a musical journey through the Golden Age of television (1948-1970). A benefit concert for the homeless and needy kids of Thurston and Mason counties, in partnership with Community Youth Services and eight local school districts, including Yelm. Read more on the Nisqually Indian Tribe. Commissioner Sandra Romero Hosts Monthly Coffees with Area Residents – Monday, February 27th, 2012. Please join Thurston County Commissioner Sandra Romero, as she hosts her monthly informal coffee hours in Rainier and Yelm on Monday, February 27th. Her guest this month is LOTT Alliance Executive Director Mike Strub, who will give a one hour presentation titled Where Does all the Sewage Go: What the LOTT Alliance Plans for Treated Wastewater in Thurston County. The LOTT Alliance is a consortium of Lacey, Olympia, Tumwater, and Thurston County that provides wastewater treatment for the area of north Thurston County including a central treatment plant, major interceptor sewer lines, pump stations, and reclaimed water plants. There is a lot happening in Thurston County, and we want to hear from you! These coffees give you the opportunity to talk about issues of concern, ask the Commissioner questions about the county, and share ideas. Commissioner Romero provides participants’ coffee that she pays for herself. She is the representative of District 2, which includes Yelm and Rainier. Where: Rainier: 9:30am 10:30am – Rainier City Hall 102 Rochester St. W.
Yelm: 11:00am Noon Fadis Restaurant (Tahoma Golf Course) 15425 Mosman Ave. SW.
Read more from Commissioner Romero’s quarterly Newsletter. The Yelm/Rainier Free Clinic Forum was very well received with alot of great feedback. We are a group of concerned citizens moving ahead with planning a Free Clinic in the Yelm-Rainier area; lets get together and talk about how you and the community can be involved in the next steps,” quoting their Facebook page. Secondhand Safari Community Wide Garage Sale & Reuse Fair! Sign up now to join the fun at Thurston County Fairs Community Garage Sale and Reuse Fair! This community event is being held on Saturday, May 5th from 8:00 am to 3:00 pm at the Thurston County Fairgrounds- 3054 Carpenter Road in Lacey. Past events have been a huge success with over 3,000 visitors and 175 vendors! Thats a lot of customers to buy your re-useable treasures! The event includes garage sale booths, educational booths, free book and magazine exchange table, entertainment, food, and more! This is a perfect opportunity to reuse those items you find while spring cleaning to swap or sell! Dont forget to bring your books and magazines for the free exchange table. There will be a $2 early-bird admission between 8:00 and 9:00 a.m. and $1 admission after 9:00 a.m.
Sign up now to have a garage sale booth and get ready to clear out your clutter. Coordinate with your friends, make it a family event, or use the opportunity to raise money for a charity. Booth space is $25 for an outdoor space and $40 for a covered space (all approx. 10×10). Set up will be the Friday before from 12:00 noon until 10:00 p.m. The doors will be locked after set up Friday evening and security will be on-site until Saturday morning. If you would like to have an educational booth or display, sign up now! All community groups, non-profits, businesses, agencies and individuals working on sustainability issues are welcomed. Come and take advantage of this great opportunity to pass on treasures to others, and benefit from the advertising and exposure you wouldnt otherwise get with a garage sale at home. In addition, this event is designed to be a nearly zero waste event, with compostable and recyclable waste being collected at waste stations staffed by Master Recycler volunteers. To reserve your space, or for more information please call 786-5453 or visit www.co.thurston.wa.us/fair.